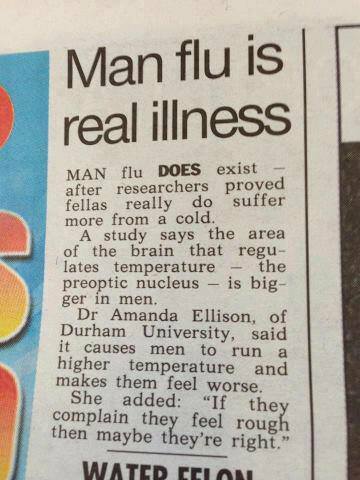 TheWraith517: Did You Know Man Flu Is Real? Not many know this but for many years i had NO sense of smell, and when i did it came and went, this lasted up until i was around 10/12... My ears and my eyes got 10 to 12 years extra brain capacity than most people. Such as blind peoples sense of touch and hearing. This has made me notice more and hear more, but that said since the pole shift my ears have felt awful some day's, such as my knees do in certain weather, my ears now to seam to change in certain atmospheric weather pressure. Anyway.. what i find more interesting about this is not so much the female side having to cut guys a little slack, but its the bosses, managers and work colleges that will probably feel worse, especially when the reasons are known.